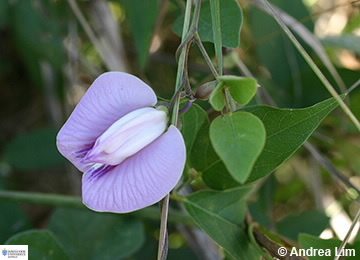 A vigorous vine with 3 leaflets, the pea-shaped flower has a large standard to 2 cm long and 2-3 cm wide pink to mauve, it is also densely hairy on the back. The pod is flattened and thickened on the margins, from 7-15 cm long and to 7 mm wide. Previously known as C. pubescens, this species is now not considered to be represented in Australia.